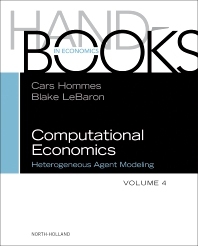 Handbook of Computational Economics: Heterogeneous Agent Modeling, Volume Four, focuses on heterogeneous agent models, emphasizing recent advances in macroeconomics (including DSGE), finance, empirical validation and experiments, networks and related applications. Capturing the advances made since the publication of Volume Two (Tesfatsion &amp; Judd, 2006), it provides high-level literature with sections devoted to Macroeconomics, Finance, Empirical Validation and Experiments, Networks, and other applications, including Innovation Diffusion in Heterogeneous Populations, Market Design and Electricity Markets, and a final section on Perspectives on Heterogeneity. Cars Hommes is one of the pioneers in complexity economics. His work on nonlinear complex economic systems challenges the traditional neoclassical paradigm of the representative rational agent in economics. In a rational world the economy is characterized by an average agent (consumer, producer, investor, etc. ), who is a perfect optimizer with rational expectations about the future. Hommes' work develops an alternative complexity paradigm based on agent-based behavioral complexity models.He has published more than 100 articles in leading international journals and book chapters and he is the author and editor of four books. He has been Editor of the Journal of Economic Dynamics and Control (2002-2012) and is the president elect of the international Society of Computational Economics. Blake LeBaron has a Ph.D. in Economics from the University of Chicago. He is the Abram L. and Thelma Sachar Chair of International Economics at the International Business School, Brandeis University. He is a Research Associate at the National Bureau of Economic Research, and was a Sloan Fellow. LeBaron also served as director of the Economics Program at The Santa Fe Institute in 1993. LeBaron's research has concentrated on the issue of nonlinear behavior of financial and macroeconomic time series. He has been influential both in the statistical detection of nonlinearities and in describing their qualitative behavior in many series. LeBaron's current interests are in understanding the quantitative dynamics of interacting systems of adaptive agents and how these systems replicate observed real world phenomenon. Also, LeBaron is interested in understanding some of the observed behavioral characteristics of traders in financial markets. This behavior includes strategies such as technical analysis and portfolio optimization, along with policy questions such as foreign exchange intervention. In general, he seeks to find out the empirical implications of learning and adaptation as applied to finance and macroeconomics.